For more than 20 years, biotechnology-derived medicines have aided those suffering from chronic conditions, including cancer, diabetes, and multiple sclerosis. Biologic drugs, which are derived from living cells, are typically genetically engineered proteins, such as monoclonal antibodies (mAbs), that can be formulated to target specific components of a disease pathway. For example, biologics designed to treat rheumatoid arthritis may target components of the immune system involved in inflammation. Biologics may offer patients better long-term outcomes than traditional, chemical-based therapies, along with the promise of fewer potential side effects. Throughout the past several years, there has been an increase in approved biological drugs and, in 2011, more than 900 biotechnology medicines were in development.1 Protein-based therapies will most likely continue to require administration to patients in an injectable format for the most part, leading to an increase in the need for such formats. Unlike traditional, chemical-based drug products, biologic molecules can be sensitive to products commonly found in prefillable syringe systems. These substances, which include metal ions and silicone oil, may impact drug efficacy and a delivery system’s performance. Additionally, biologic molecules are typically very large and may require a higher concentration of the drug product for efficacy. The result is a drug product whose viscosity is significantly higher than currently approved self-injected products. In a traditional drug delivery system, such high viscosity may require clinical administration, multiple dosing, or more frequent injections, which can be less convenient for the patient. Many biologics in use today are administered via intravenous (IV) infusion in an acute-care setting. However, trends toward self-injection and home care have increased demand for products that are easily injected by patients or caregivers in a home setting. At present, there are several approved biologic products intended for self-injection by patients, including Johnson and Johnson’s SimponiÂ®, Amgen’s EnbrelÂ®, and AbbVie’s HumiraÂ®. These injections are typically designed for delivery into the subcutaneous space, require a relatively low dose (< 100 mg) for efficacy, and have a reduced risk of life-threatening adverse reactions. Both Simponi and Humira are packaged in 1-mL long prefilled syringes and dosed on weekly, semi-monthly, or monthly basis, depending on the patient’s particular indication. As biotechnology companies continue to create and test therapeutic proteins for new therapeutics that may require larger doses given over a longer period of time, packaging and delivery challenges may arise. As the trend toward selfadministration continues, the need for careful consideration of primary container design, interaction with the drug product, method of administration, and end-user needs becomes more critical. 1. The needs of the patient, caregiver, and healthcare professional: A drug delivery system should take into consideration the clinical benefit, ease-of-use, and the ability to adhere to a treatment schedule. 2. The drug: A drug product must provide effective treatment in an appropriate form that enables effective delivery with an optimum delivery rate and frequency. 3. A primary containment system: The drug must be held in a container that maintains effectiveness, safety, and optimum quality over a period of time. 4. A delivery device or system: The drug should be compatible with the containment system and designed to enhance the drug delivery experience for the patient or caregiver. Understanding the key elements of a drug delivery system provides the cornerstone for biotechnology manufacturers to deliver a unique system that meets the needs of the drug and the patient while mitigating product and development risks and encouraging patient compliance. In addition, drug manufacturers should seek a partner who can offer innovative technology, manufacturing excellence, and ensure patient needs for safety and efficacy are built into drug product packaging from early stage development. Such partnerships will help drug marketers offer successful, integrated solutions, benefitting manufacturers, clinicians, and patients alike. To make an effective product, the patient must be at the forefront of the design of the delivery system. Human factors testing enables manufacturers to support delivery system development from a range of critical perspectives and makes it easy to predict (and design out) user-based risks or failures. Recent FDA guidance on human factors and the mitigation of user-based risk in the development of medical devices has spurred biotechnology manufacturers toward understanding the scope, depth, and nuance of human factors engineering and design for usability. Human factors experts, those experienced in both the science and art of understanding human capabilities and limitations, have developed a thorough understanding of design options and how they affect human interaction. For any product on the market, a measure of success is the consumer’s ability to use that product effectively. In the healthcare arena, a successful delivery system must be easyto- use, intuitive, efficient, and effective. In addition, any system must be safe for the patient or caregiver to use in the environment for which the product was intended, which could include the home setting. Biotechnology and packaging manufacturers must work together to ensure ease of use and mitigate risk, which may help to improve patient dosing compliance through the use of a device or system that considers the needs of the patient as well as the drug. To design a delivery system that will resonate with patients, it’s important to first understand the behaviors and motivations of the intended user groups. Insight into the unique experiences and situations of those users can be best achieved by conducting research that will drive innovation in design and development processes to create a solution that works for end users in a variety of situations throughout the course of treatment. New designs are evolving around the needs of today’s growing biotechnology markets. Many of these technologies may increase the price of the drug product, and biotechnology companies are challenged to justify those additional costs, particularly in reference to the delivery system or device. Integrated systems that encourage ease of use may aid in increased sales, higher revenues, customer loyalty, and retention of market share. However, to justify the cost, it may help to go further back in the manufacturing process. Material selection can make a difference in the quality of the product. Moldable cyclic olefin polymers (COPs) can be used throughout a drug product’s lifecycle, which can diminish the many rounds of testing required to ensure the drug product is stable in different containment systems. Other quality issues, such as rejection rates and breakage, can be mitigated through the use of high-quality polymers. Often, the extra cost associated with these materials can be justified through quality improvement and increased sales as well as a faster move to market. Glass prefilled syringe barrels still dominate the market despite several limitations, including quality and performance issues that may directly affect patients and caregivers. Switching from a glass to a COP-molded prefillable syringe can reduce variability and breakage issues associated with glass, as well as reduce the need for silicone oil, another potential source of drug product contamination. With the development of novel materials, including COPs, manufacturers can now select a high-quality, transparent, break-resistant material that is more inert than glass, is scratch resistant, and can reduce potential for particulate contamination from the syringe barrel. These components also can be stored and shipped at low temperature, which is a common requirement of many biologics. With a prefilled syringe system using a plunger coated with a fluoropolymer barrier film, superior and consistent break loose and extrusion forces can be achieved without the use of silicone oil as a lubricant. The film is molded to the surface of the plunger and provides a barrier against constituents from the elastomer leaching into the drug product. Another benefit of a siliconeoil- free system is the reduced risk of silicone-induced protein aggregation. In addition, because COP barrels are manufactured using injection molding technology, dimensional tolerances can be very tight, which helps to ensure consistent functionality (eg, break loose and extrusion) and minimize the risk of incompatibility with secondary devices, such as auto-injectors. â€¢ Flexibility: COPs allow for customized sizes based on the attributes of the drug, such as large volumes and viscosity. â€¢ Durability: COP offers high break-resistance and consistent break loose and extrusion, as well as excellent low-temperature characteristics. â€¢ Low Risk of Reactivity: COP offers low exposure to extractables and leachables as well as low particulate levels, minimum levels of adsorption and absorption, and improved drainability. â€¢ Visibility: COP has high transparency. 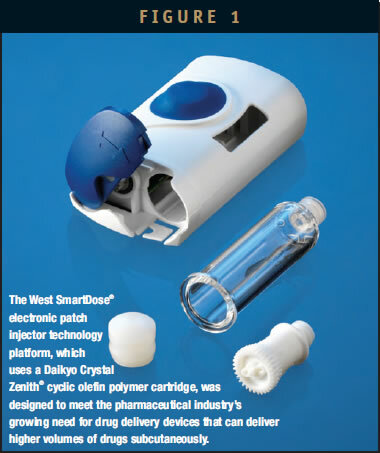 Recent trends in auto-injectors include the increasing use of electronics for reusable systems, continuing growth in disposable devices and ergonomic enhancements designed to improve an impaired patient’s ability to deliver an effective injection. However, current systems based on glass primary containers have had problems with issues such as breakage, incomplete injection, and variability of functional performance. Many are also limited with regard to dose size, which can detract from the patient experience either by requiring more frequent injections or intravenous administration due to the high volume of drug needed. With the increasing trend toward self-injection and home administration of drugs, there is a growing need for drug delivery devices that can deliver higher volumes of drugs subcutaneously. Innovations in this area include novel devices that are attached to the body, such as a patch injector, or delivery systems that meet the requirements of biologics. Whether seeking to create a custom integrated delivery solution or to package a drug product in an existing delivery option, such as an auto-injector, biotechnology companies should seek out a partner with expertise and experience in providing packaging solutions. Packaging manufacturers who are focused on providing quality solutions will have the knowledge and partnerships in place to ensure that all four key elements of an integrated design are met. New and innovative drug delivery systems can optimize the quality of life for patients by effectively managing the interrelationship of the four primary components: the drug, the end user, the primary container, and the delivery system. Together, packaging and biotechnology manufacturers can work seamlessly as partners to provide innovative solutions that help mitigate risk, encourage patient adherence, and enhance value through unique integrated delivery combinations. 1. Adis R&D Insight Database and PhRMA. Kevin Cancelliere joined West Pharmaceutical Services, Inc. in January 2013 as Director of Marketing, Pharmaceutical Delivery Systems. Mr. Cancelliere brings almost 30 years of broad operational and strategic marketing and sales experience to this position. He came to West from Vicept Therapeutics, where he was Senior Director of Project Management for an investigational drug for the treatment of Rosacea. 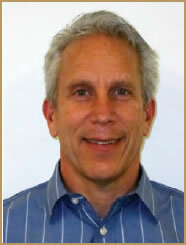 Prior to Vicept, Mr. Cancelliere was the Senior Director, Marketing at Wyeth Laboratories. Mr. Cancelliere earned his BS in Biology from De Sales University and his MS in Biochemistry from Thomas Jefferson University.